No question, the "Willoughby" episode, in which the frazzled ad man jumps off the train to his death. Actually, there are two ways to look at it. It?s more of an allegory. Some people would say that the man simply ?got off the train at Willoughby?. > Actually, there are two ways to look at it. Its more of an allegory. Some people would say that the man simply got off the train at Willoughby. Is that like Uncle Charlie getting off the train in Shadow of a Doubt ? My favorite episode is *The Howling Man*. Just last month I bought "The Collected Twilight Zone" from Amazon.com for $130 (down from $300). It has all 156 episodes plus some extra features like interviews with actors, but there are no subtitles or foreign language tracks. That's very disappointing for me. Still, this is my favorite TV show of all time, so it was worth the price for me. My favorite episode? Oh, there are so many. Burgess Meredith's "Time Enough to Last" was brilliant, but it's been so parodied that it's lost a little luster. I really liked "Five Characters in Search of an Exit" about the characters in the barrel. "I Shot an Arrow" about the astronauts who crash-landed. "Midnight Sun" with Lois Nettleton..."My Son Pip" with Jack Klugman...There are just too many good episodes. > Is that like Uncle Charlie getting off the train in Shadow of a Doubt ? No, uncle Charlie fell. But James Daly ?got off the train at Willoughby". A stressed out modern commuter gets off the train at Willoughby, a small town in the 19th Century. During a nuclear attack warning neighbors try to break into their friend's (Larry Gates) fallout shelter. The one about the ?monsters? on Maple Street. The ?monsters? turn out to be us. Three astronauts who were the first men in space, return to earth and they disappear one by one, leaving the last one to know the terrible truth that he was about to cease to exist. A business man is alone in his office at work and hears someone yell ?Cut?. He looks up and sees that he is in an office set on a sound stage in Hollywood, in front of a film crew that he knows does not exist. A pretty lady in a closed department store realizes she is not what she thinks she is. A man traveling in Europe on foot stumbles across a religious order that has trapped the Devil (Robin Hughes). A disfigured woman (Donna Douglas, voice of Maxine Tyler) undergoes plastic surgery in order to look more like everyone else. A man (Dennis Weaver) convicted of murder tries to convince those about to execute him that it?s all just a recurring nightmare of his. After a plane arrives without a crew or passengers, Grant Sheckly (Harold J. Stone), an FAA inspector, tries to solve the mystery. A woman (Lois Nettleton) tries to survive as the earth hurtles toward the sun. An alien race arrives on earth with a promise to help solve mankind's problems. A man (William Shatner) recovering from a nervous breakdown sees a creature on the wing of the airplane he's on. A real unique classic TV series. One of the earliest sitcoms I remembered. Whats funny is that I am now a little over 50 and I feel like at times I'm living in "The Twilight Zone". What a world. "The Twilight Zone" and the "Outer Limits" were to me a match pair that went well together. I agree. The show was unusual because some of the ?impossible? plots seemed quite possible. Some were dream-like. Some were like nightmares that we have all had, and in that respect the ?impossible? became ?possible?. Some were strong allegories about life in general, such as the ?Maple Street? episode. Although that story was condensed into just 24 minutes, it represented some real experiences that just about everyone has had in life. > A real unique classic TV series. One of the earliest sitcoms I remembered. > Whats funny is that I am now a little over 50 and I feel like at times I'm living in "The Twilight Zone". What a world. In a future totalitarian society where books have been banned, librarian Romney Wordsworth (Burgess Meredith) is put on trial for the crime of being obsolete. I tell young people on the internet about things I?ve learned, and they ask me to ?provide a link? to the information. They never mention books, and they often don?t believe what I say is true if they can?t ?Google? websites about the topic. The older I get, the more ?disfigured? I become, when the world-standard of ?good looks? is ?youthful?. Every year I say I'm going to be an "Eye of The Beholder" face for Halloween but wait too long to fabricate it. I just love those pig faces. I also quite like The Masks episode. Rod Serling (NOT STerling) was from my area and I've visit his birthplace and grave regularly. He grew up close by Recreation Park in Binghamton and "Walking Distance" episode accurately depicts his hometown, even down to the Herschell carousel. There is a plaque in the bandstand commemorating this. When I restored that carousel I looked at every horse closely for a "RS" carved in it, but he must have been too nice a kid. 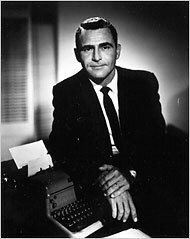 He lived a rather short but fruitful life and left us some fabulous writing, The Twilight Zone will always be his masterpiece. I totally dug THE TWILIGHT ZONE!!!! What a rockin' show! *One for the Angels*: Lew Bookman (Ed Wynn), a small time salesman, makes "a pitch for the angels" in order to save the life a young girl. *Nothing In The Dark*: An old woman holes herself away in her home, fearing Death is waiting outside. When a young policeman (Robert Redford) is wounded and dying outside her doorway, she is reluctant to help him. *The Invaders*: A flying saucer lands in the attic of the home of a poor, rural woman (Agnes Moorehead). Frightened, she eventually gains enough courage to get to the attic and destroy the craft, which turns out to be from a very surprising place. Man, you folks are citing such EXCELLENT episodes of this show! I'm jonesing for it now! I wish someone would show a marathon soon (hint, hint, what's left of the Syfy channel (yeah, I know the spelling is weirdo)! Ever have the feeling that Rod Serling is standing around the corner talking about you? "The After Hours" -- Anne Francis finds a department store quite disturbing. "The Grave" -- Bounty hunter Lee Marvin is not superstitious. "It's a Good Life" -- Billy Mummy is an obnoxious little brat that everyone caters to. "Printer's Devil" -- Burgess Meredith as a typesetter with a nose for news. "I Dream of Genie" -- Howard Morris figures out the perfect wish. A guy in a military jumpsuit is alone in a small town. He can't remember who he is or how he came to be there. He goes into a cafe, police station, etc., but can't find anyone anywhere. It finally comes out that he's training to be an astronaut and being in an isolation booth for nearly a month caused an hallucination. What Serling wanted (and used in the short story he wrote based on that script) was when the guy goes into a movie theatre, there's no one selling or taking tickets, so he takes a ticket, tears it in half, and sticks the stub in his pocket. Later, when he's being carried out of the isolation booth, he reaches into his pocket and pulls out that stub. While people who read science fiction loved that little twist, Serling was trying to sell the series to CBS and knew it would be too over the top for them. Frisbey+. He too encounters aliens and gives them what for. visuals look very good. B Seeing U. > allegories. Some are a little too pat and are obviously dated. I saw them when they first aired, and they were very up-to-date at that time. For example, by 1961, people and cities had been building ?fallout shelters? for several years, and most cities had local buildings designated as fallout shelters, so when ?The Shelter? aired on Sept. 29, 1961, that was up-to-date, and it told everyone for the first time that a simple basic basement fallout shelter could be broken into by the closest neighbors. That was quite shocking. "Give me a string bean, I'm a hungry man." The very first episode of TZ, "Where Is Everybody? ", Oct. 2, 1959, about the hallucinating astronaut test subject.... well, info about this type of scientific experimentation had already been in news magazines recently, because our first astronauts in the future would have to be in space alone in tiny capsules for several days or weeks. "Time Enough at Last" (Nov. 20, ?59), where Burgess Meredith was the last living survivor in his city after an atomic attack, this had already been prophesized and discussed by the media earlier in the ?50s. So when we saw this stuff on TV for the first time, it was shocking. And this was well before movies like ?Fail Safe? and ?Dr. Strangelove?. What is the Name of the Twilight Zone Episode, where this Lady is waiting @ a Bus Depot & she keeps seeing a Double of herself, everywhere she turned. A kind gentleman tries to help her, but instead has her committed, but not without an eerie ending . . . This Episode was the Very First one I'd seen which had a lasting impression on me. My brother & I used to watch Twilight Zone, while sitting on the sofa with a blanket, which I hid under, when necessary . . . which was often, during each story. Even to this day, whenever I hear that 'Eerie' Music, that's played in the beginning & end of each story, sends 'Chills' down my spine. At 56, I still find myself turning down the sound of that Music, when I'm by myself. And the earlier stories, in Black & White, gave off Deep Shadows, that added to the Mystery & Suspense of Each story ! Rob Serling was a Genius, to say the least, and Yes, he Certainly did Leave a Lasting Legacy ! badly people will act when under pressure, real or imagined. played the helpful stranger, but don't remember the name of the episode off hand. > What is the Name of the Twilight Zone Episode, where this Lady is waiting @ a Bus Depot & she keeps seeing a Double of herself, everywhere she turned. A kind gentleman tries to help her, but instead has her committed, but not without an eerie ending . . .
Mirror Image with Vera Miles and Martin Milner. Oh I almost forgot another favorite classic episode. Don't recall the title, but you'll know it when I say, "Marcia....Marcia..." That episode with the girl trapped in a department store and hearing her name spoken over & over. Turns out she's a mannequin allowed to "be alive" for 24 hours and the other mannequins are calling her back. I used to be a window dresser in a department store back when stores HAD window displays. Every morning when I'd turn the lights on in the mannequin room I'd say, "Good morning Marcia....ready for another day at work?" When the store went out of business, I bought a few "Marcias" to keep in the attic. I even have one peering out the window up there. Mannequins have a way of creeping people out. Rod Serling certainly had the imagination! > Oh I almost forgot another favorite classic episode. Don't recall the title, but you'll know it when I say, "Marcia....Marcia..." That episode with the girl trapped in a department store and hearing her name spoken over & over. Turns out she's a mannequin allowed to "be alive" for 24 hours and the other mannequins are calling her back. Marsha White (Anne Francis) is a woman browsing for a gift for her mother in a department store. She ends up finding out that she's not the person she thinks she is.